For the region of planet Mars, see Aeolis quadrangle. Not to be confused with Aeolus. Aeolis (Ancient Greek: Αἰολίς, Aiolís) or Aeolia (/iːˈoʊli.ə/; Αἰολία, Aiolía) was an area that comprised the west and northwestern region of Asia Minor, mostly along the coast, and also several offshore islands (particularly Lesbos), where the Aeolian Greek city-states were located. 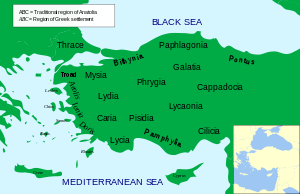 Aeolis incorporated the southern parts of Mysia which bounded it to the north, Ionia to the south, and Lydia to the east. Aeolis was an ancient district on the western coast of Asia Minor. It extended along the Aegean Sea from the entrance of the Hellespont (now the Dardanelles) south to the Hermus River (now the Gediz River). It was named for the Aeolians, some of whom migrated there from Greece before 1000 BC. Aeolis was, however, an ethnological and linguistic enclave rather than a geographical unit. The district often was considered part of the larger northwest region of Mysia. Greek settlements in western Asia Minor, Aeolian area in dark red. According to Homer's description, Odysseus, after his stay with the Cyclopes, reached the island of Aeolia, who provided him with the west wind Zephyr. 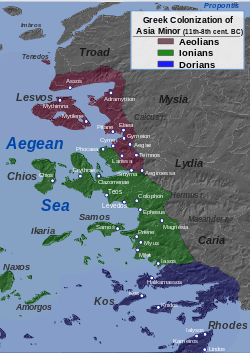 In early times, by the 8th century BC, the Aeolians' twelve most important cities were independent, and formed a league (Dodecapolis): Cyme, Larissa (also called Phriconis), Neonteichos, Temnus, Cilla, Notion, Aegiroessa, Pitane, Aegae, Myrina, Gryneion, and Smyrna. Attalus III, the last king of Pergamum, bequeathed Aeolis to Rome in 133 BC. Shortly afterward, it was made part of the Roman province of Asia. At the partition of the Roman Empire (395 AD), Aeolis was assigned to the East Roman (Byzantine) empire and remained under Byzantine rule until the early 15th century, when the Ottoman Turks occupied the area. ↑ Herodotus. The Histories: 1.149.